Last night I attended a cocktail party hosted by Eva Mendes celebrating the launch of the Eva Mendes x New York & Company pop-up shop. Eva,who personifies every atom of the modern day pin-up doll, was sweet, funny, and incredibly gorgeous (check out my Instagram for my pic with her!) and truly embodies the retro femininity of her spring collection. My Vogue family sent me the GAP Academy Blazer which is a part of the Lived In Collection to wear to the party and although the tags just came off, the blazer felt incredibly soft as if I'd been wearing it forever. It's the best of both worlds as I get to dress up the outfit with a structured blazer without feeling stuffy and rigid. Although I usually dress up heels with blazers, I opted to stick with the comfy theme and wore my favorite Justfab flats instead as I'm obsessed with the floral cut-outs! OMG you look so classic with that outfit, so lovely. 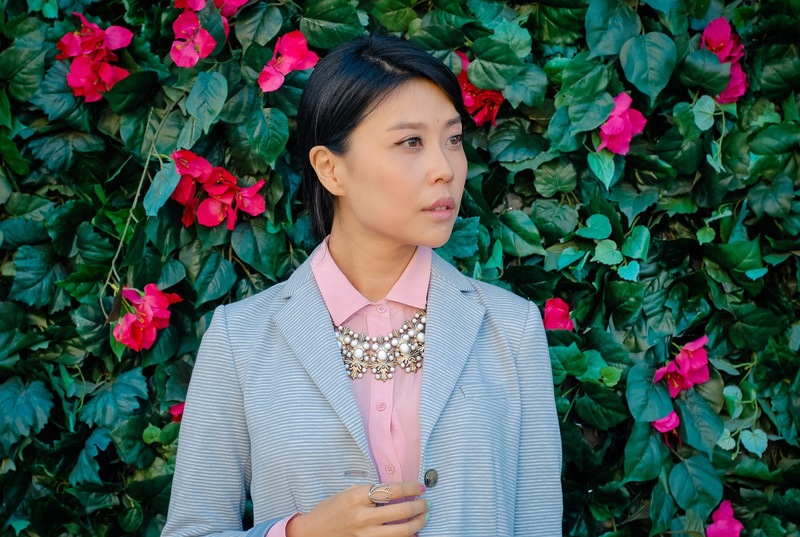 Love the pink on pink look and how you styled it with the blazer!